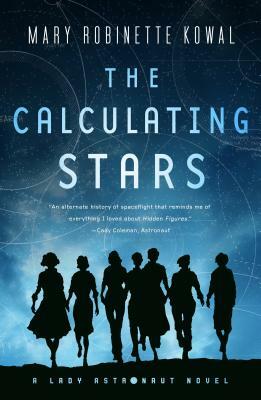 Let me get straight to the point: Mary Robinette Kowal’s new novel, The Calculating Stars, is one of the best alternate histories I have read since… It is 1952. Dewey is president. Elma York and her husband, Nathaniel, are on vacation in the Poconos. They both work for the newly-formed National Advisory Committee for Aeronautics. Nathaniel is the chief engineer and has a reputation for putting up America’s first satellites. Elma is a mathematician, a superb one. She is also a former WASP pilot, which fact figures prominently in all that follows. In the midst of their idyllic vacation, a meteor slams into the Atlantic just off the east coast. It destroys Washington D.C. and wreaks havoc up and down the seaboard. Elma and Nathaniel manage to get out and to her plane and west until a fighter squardon challenges them, learns who they are, and escorts them to Wright-Patterson Air Base, the only fully operational military base within range. There they learn the extent of the immediate losses. CalculatingStars_comp_v7_final-220x338 Quickly, the government scrambles to get up and running. The only surviving member of the Cabinet is the Secretary of Agriculture, who becomes Acting President until an election can be held. This, too, is very important. While the pieces are being picked up and some kind of order restored, Elma is asked to calculate the size of the meteor so her husband can go into the meetings with the paranoid military and convince them this was nothing to do with the Soviets. She crunches the numbers and discovers to her shock and dismay that this was an extinction-level event. In 50 or 60 years, the Earth will be too hot for survival. Kowal lays all this out meticulously. The science has the resonance of reality. So do the politics, the culture, the economics. In fact, this is a very well thought-out scenario. For Elma, Nathaniel, the Acting President it means one thing: humanity has got to get off the planet. Which kicks the space program into high gear in the early 1950s. The novel is soaked in telling details. And while it offers plenty of science and rocket-geek delight, it is also a story of challenging culture and social norms and overcoming personal difficulties in the face of all that the 1950s—our 1950s—was about to be. Kowal brings the culture into play with a seamless grace that produces a “well, of course that had to change” which occasionally leaves a residue of embarrassment. Embarrassment at how we know things were and even how they still are. We talk about Wake Up Calls when faced with growing or entrenched social problems, matters of injustice, the unexamined givens of the world. Kowal delivers the ultimate Wake Up Call. And then shows us just how resistant people can be to making absolutely necessary changes if they challenge how we believe the world ought to be. She puts ought to be on trial in a compelling narrative that seems to be all about building the future writers like Heinlein and Clarke expected. They neglected a few of the underlying pitfalls of trying to do so. As well, we are treated to a protagonist completely human, flawed and excellent in her abilities and craft and sensibilities. Elma York is composed of the stuff we want to cheer and she carries us along with a convincing humanity that includes a heart as large and full one could wish for. Her relationship with Nathaniel is wonderfully portrayed. But it is Elma’s constant checking of privilege as she works to bring women into the astronaut corps and has to face the fact that she had often been blind to things sometimes right in front of her. Living up to her own values becomes a process well worth following. This the first book in a new series. If it continues with the same verve and attention to detail and sheer passion, we may be looking at a landmark work. In 1952, a giant meteorite lands off the east coast of the United States. Mathematician Elma York and her husband, engineer Nathaniel York, come to a frightening conclusion: Earth's climate is about to rapidly change, and eventually, become inhospitable to humans. It's time to figure out how to get off the planet, and fast. That's how "The Calculating Stars" begins, and from there, spins an alternate history of the formation and development of the International Aerospace Coalition (in place of the US-based NASA), and its attempts to get humans to the moon and beyond on a much faster timeline. We follow Elma, a computer at the IAC and former WWII WASP pilot, as she rallies for women to get the chance to become astronauts alongside the men, while also dealing with government officials who remain hyperfocused on Russia, a public who dismisses the threat of climate change, her own anxiety, and a burgeoning understanding that, in the fight for women's rights, no one succeeds unless everyone succeeds, including her friends who are women of color. "The Calculating Stars" is both a remarkably timeline story, and a riveting re-telling of humanity's race into space through a brilliant new lens.